Airports that are using CFM to track and measure passenger flow include Manchester in the UK, Landvetter in Gothenburg, Kastrup in Copenhagen, Amsterdam Airport Schiphol, Frankfurt and Hamburg-Fuhlsbüttel. In addition, several airlines all over the world including Virgin Atlantic use CFM from Qmatic to manage the passenger flow and to improve their operational efficiency. Qmatic is all about valuing time and making waiting worthwhile. Qmatic is the inventor of CFM and is also the world’s largest queue management company. CFM is a methodology for managing customer flow and experience from initial contact through service delivery. Qmatic operates in 122 countries and has 51,800 installations worldwide in the finance, retail, travel, healthcare and public sectors. 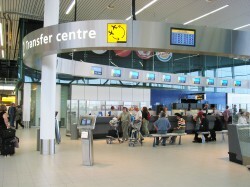 Qmatic’s consultants assist travel operators in improving the passenger experience when passing through an airport. This can help raise the airport’s community profile and increase its competitive advantage. 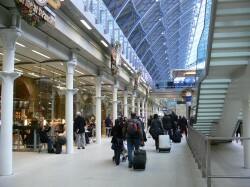 Typically consultants from Qmatic undertake programmes mapping passenger journeys at peak times, identifying key triggers and pinch points, and providing recommendations for quick wins and long-term improvements. 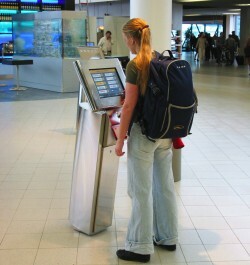 Travellers through Schiphol Airport in Amsterdam use Qmatic’s customer service point to select which airline they want. As they take a ticket they are placed in the virtual queue and will not have to stand in line whilst waiting for service at the transfer desk. When linear queuing is well managed, the service provider can benefit from reduced service hours, a better use of floor space and big savings in the cost of resource. Linear queuing can start with simply laying out the line better and using barriers. This seemingly simple measure creates a great improvement and feeling of fairness. To get the biggest business benefits you need CFM methodology and the introduction of Qmatic’s electronic call forward systems. Our barriers are manufactured to the highest build standards and include our own patented safety tape cartridge. We have our own barrier manufacturing facility so we can bypass the middleman and sell directly to you, ensuring great prices without compromising product quality or after-sales support. Barriers combined with call forward gives you a linear queuing solution that is easy to install, for fast moving situations with high volumes of passengers. The challenge of providing adequate, well-priced, cost-effective and on-time transportation to passengers requires more than just planes, airports and personnel. Much time and money is spent by private and public entities to ensure that these critical modes of transport function properly, safely and successfully. The goal is that passengers who need the service can depend on it and revenue is maximised. The customer counting solution ensures that managers, schedulers and operational and safety personnel understand the operational needs of the service based on accurate passenger counts. Real-time count and location of current passengers is also available to improve reaction time during transit failures and emergencies. Customer counting is an additional, but totally aligned component of CFM. 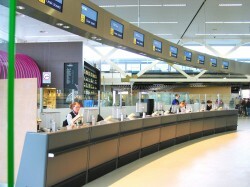 It can be used with both linear and virtual queuing systems to better manage the customer flow. As a result the client can get a more holistic view of the customer and staff situation in a face to face service environment.